And thanks for all the jellyfish. If the oceans are indeed in steep decline, it may just be a triumph of the brainless -- namely, the humble jellyfish. "The number of case studies is increasing," Lucas Brotz of the University of British Columbia Fisheries Centre told the Huffington Post, "And it certainly seems we are having a severe impact on the oceans that is making them less favourable for fish and more favourable for jellyfish in some places." So far, the most direct impact -- aside from swimming into a cloud of the critters -- is being felt at the world's nuclear reactor sites. Remember that backed-up nuclear site in Sweden last week? Oskarshamn, one of the world's biggest nuclear plants, had to shut down for days after the intake pipes were found to be completely clogged. "We had a huge invasion of jellyfish," plant spokesman Torbjorn Larsson told the Wall Street Journal. "Our staff calculated over a tonnne." More specifically, about a tonne of Moon jellyfish. For climate change deniers, this may pack an extra sting. If the world's jellyfish are taking it to the top, we may have a lot to do with it. The Moon variety, for example, despite being brainless, appears to have mastered the hostile takeover. Their bodies are built for extremes, able to withstand temperatures as low as -6 degrees C and as high as 31, not to mention an uncanny ability to slow its respiratory system to a crawl in low-oxygen waters. With ocean temperatures on the rise, and "dead zones" of severely depleted oxygen emerging, the humble jellyfish is exactly the sort of lean, mean aquatic machine we may expect to see a lot more of in the post-oceanic Apocalypse. "Warmer oceans can influence jellyfish in a number of ways, such as increasing their reproductive output, increasing survival, expanding their ranges, or allowing them to be around for longer," Brotz explains. Now, factor in a human propensity for strip-fishing. "Many of the regions where jellyfish populations appear to be increasing are heavily fished or overfished," Brotz says. That leaves a lot of wide open sea for jellyfish. And, of course, a lot of havoc to be wreaked on the machinery of humankind. In addition to Sweden's nuclear stutter, last year saw California's Diablo Canyon facility grind to a halt due to "a rapid influx of jellyfish." The fishing industry knows this gelatinous tide all too well. In 2009, the crew of the Japanese fishing trawler, Diasan Shinsho-maru, got a close-up of the fridge-sized terror known as Nomura’s jellyfish. Their nets had become so laden with the giants -- each weighing around 200 kg. -- the entire vessel tipped over, hurling the anglers into the sea, The Telegraph reported. Tne notorious box jellyfish reportedly claims the lives of between 20 and 40 people in the Philippines alone, according to the U.S. National Science Foundation. Despite a recent rash of high-profile run-ins with humanity, it remains to be seen whether we're in the throes of a jellyfish uprising. "The popular idea that jellyfish are increasing globally caught on quickly, and scientists are scrambling to catch up," marine biologist Rebecca Helm tells the Huffington Post. "We still don't know if there is in fact a global surge in jelly numbers. We are seeing localized increases in some areas." But, she cautions, "We do not have a good baseline for what jelly populations were doing 100 years ago, this makes it difficult to determine if the fluctuations we're seeing today are the result of human activity, or a natural part of the jelly life cycle." Although counting all the jellyfish in the ocean is a daunting and difficult task, their devastating impact on marine life -- and industry -- has come into sharp focus in recent years. "There is a lot of uncertainty, due in part to the fact the fact that they have historically been ignored and understudied, as well as their very unique life cycles," Brotz explains. But after surveying 45 marine ecosystems, Brotz found evidence of increases in 62 per cent of the regions studied. There are, of course, a few compelling reasons why jellyfish are so well-suited to inherit the seas. Jellyfish will eat your lunch. From fish eggs to tiny plants, they can scour an ecosystem dry. And a herd of jellyfish, called a bloom, will 'eat almost everything in the water.' Needless to say, that doesn't leave much to dine on for the rest of the ocean's denizens. Few have a taste for jellyfish. And the creatures that do -- sea turtles, salmon and other culinary daredevils -- are in decline. They have a Tribble's sense of spawning. Jellyfish essentially clone themselves -- creating tiny bundles, called polyps, that latch onto hard surfaces. "When humans build structures in the oceans, such as marinas, wharves, breakwaters, aquaculture operations, oil rigs," Brotz explains, "They provide a massive amount of shaded structure. These structures may provide ideal habitat for jellyfish polyps, which then thrive and reproduce to create millions of baby jellyfish." They laugh at death. In a rare effort to quell the tide of jellyfish, South Korean researchers built tiny Terminators, called JEROS, or Jellyfish Elimination Robotic Swarm. Essentially sucking jellyfish to their doom through propellors, JEROS can mulch a reported 400 kg of jellyfish per hour. As wholesale jellyfish shredders, JEROS certainly make for impressive video -- even if some YouTube commenters suggest they amount to medieval torture devices. Trouble is JEROS may also be making fertilizer. 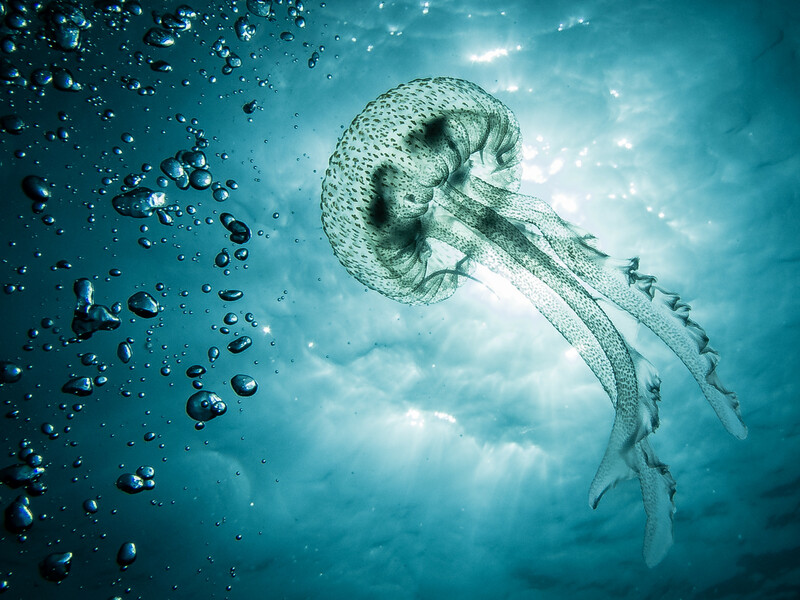 "Removing jellyfish -- either by humans or robots -- is not a true 'solution,'" Lucas Brotz says, "Because jellyfish polyps can persist in the environment and produce new jellyfish year after year." And, pity the hapless swimmer, caught in that wave of mutilation. "If you want to protect tourists from stings, this will make the problem worse, releasing all those tentacles to float independent of their bodies, getting through the smallest mesh," biologist Rebecca Helm notes. Or, as Helm notes, humans could embrace the coming Jellageddon -- figuratively speaking, of course. "Farming jellies is a lucrative business in some parts of the world." Indeed, she notes that in the state of Georgia, 'jellyballing,' as it's called, has grown into a major fishery. China appears to be diving right in, building a multi-billion-dollar industry out of edible jellyfish. China is among the first countries to process jellyfish for human consumption, particularly the edible Rhopilema esculentum, and is developing a multi-million-dollar seafood business based on jellyfish. "I think the best solution to the jelly problem some areas are facing," she adds. "Is to improve our ability to predict when and where they will occur, and plan accordingly."